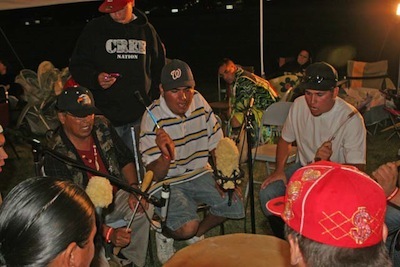 Under our record label, Tribal Spirit Music we have recorded many of today's most popular native drum bands including a Tribe Called Red, Chippewa Travellers, a Tribe Called Mi'kmaq, Smoke Trail, Sheldon Sundown, Black Bear, and Eastern Eagle. All available from us in hard copy or for download at our main music and powwow drum site. 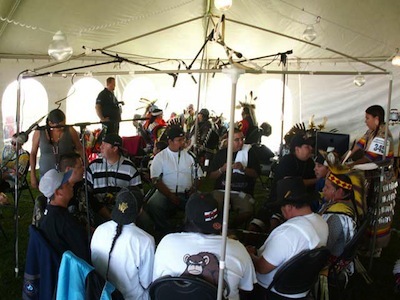 As Native Drum Makers we began recording Powwow Drum Groups with one of the first groups to play our powwow drums; Black Bear from Manawan, Quebec. 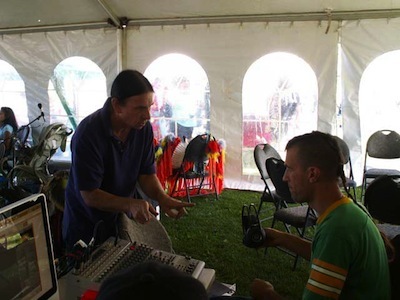 The CD Akwesasne Live went on to be nominated for the 2008 Canadian Aboriginal Music Awards. We were beaten by Northern Cree, but the boys from Black Bear were thrilled just to be nominated. Over our life experience we have developed a strong belief in fair economic development and have gained friends in many different creative professions. This combination led us to begin recording Native Music. Native Musicians are blossoming all over Turtle Island. The old and new songs are just pouring in. We saw that one of the biggest blocks for this musical and creative expression was the musicians' ability to economically afford to be as great as they could be. Especially for large drum groups, the cost of travelling with their families all over North America can bring even the best, most talented group to a stop. Tribal Spirit facilitates the production of a CD by bringing together Errol Francis, and a good friend, Gustavo (who is a graphic designer). Without contracts or a large outlay of cash, we work together with the artists to produce a very high quality CD and cover. This helps groups to continue to sing and excel (with no crazy $ buy backs). In the end, the musicians and Tribal Spirit share in the residual benefits of our combined efforts. The notion of Fair Trade products has a long history in the developing world. We believe that good trade means that both sides of the partnership must come out on top. In June 2010 we proudly released CDs from two groups that we have worked with for years. Eastern Eagle Rezonation and Chippewa Travellers All My Relations. In November 2010 at the Canadian Aboriginal Music Awards, Chippewa Travellers won Best Album Cover and Best Traditional Powwow Album! Buy online at www.tribalspiritmusic.com or at itunes as well as all other online music suppliers. Copyright © 2019 Native Powwow Drums | Hand Drums | Native Arts. All Rights Reserved.